Colombian President Juan Manuel Santos visited the border with Venezuela Wednesday evening days after more than a 1,000 Colombians were expelled from the neighboring country. Last week, Venezuela President Nicolas Maduro ordered the closure of the border between the Colombian city of Cucuta and the Tachira state of Venezuela. On Saturday, this was followed by the order to deport hundreds of Colombians living in the area after three national police officers were attacked while patrolling for contraband smugglers. Since then, more than 1,000 Colombians have been deported and others voluntarily fled the neighboring country, causing a humanitarian emergency in Cucuta that was struggling to find shelter for the remigrants. 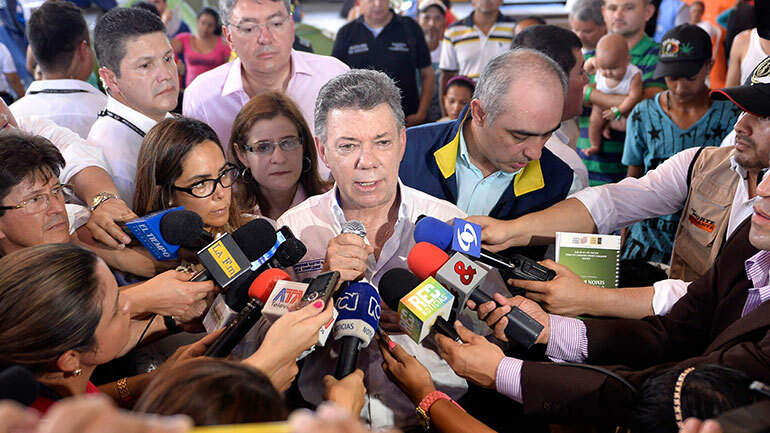 Speaking in the border city, Santos promised immediate help for the newly-returned Colombians so they can resume their lives in Colombia. “In terms of housing … we will give each deportee a subsidy … of 250 thousand pesos ($76) so they can leave the shelters and pay rent while settling in, while they go look for work, while they also go look for a home,” said Santos. Additionally, the president vowed the government would create 2,300 jobs to help the deportees to generate their own income. Until this point Santos had remained in Bogota, choosing instead to send Foreign Minister Maria Angela Holguin and Interior Minister Juan Fernando Cristo to take charge of the situation. Santos’ predecessor, the staunchly conservative Senator Alvaro Uribe, did take a detour from campaigning for the October local elections and took the opportunity to harshly criticized Santos, accusing the president of prioritizing diplomatic relations with “the Venezuelan dictatorship” over the plight of Colombian citizens. But Uribe — Santos’ most vociferous opponent both inside and outside of Congress — was not alone in his criticism. Those who live on the border have also been wondering why the head of state did not attend the crisis. “There’s been some resentment, people are frustrated with Santos because he hasn’t shown up here until today,” Manuel Rueda, a reporter for Fusion, told Colombia Reports. This trip comes after the two countries’ foreign ministers met in Cartagena to address the situation. After a seven-hour meeting, the two dignitaries did not announce any plans to end Venezuela’s unilateral border closure nor cease the deportation of Colombians. Instead, Colombia’s foreign minister announced that deportees would have the opportunity to get their belonging’s back, something she had already announced before the meeting. “They will be able to bring their things after a fight of several days, in this we will not waver, and I want that that remains very clear,” said Holguin. According to Rueda, the Colombian Civil Defense has been able to cross the border and recoup some families’ possessions. Beyond that, families have been crossing the Tachira River and heading into Venezuela on foot to collect their belongings. Venezuela’s surprise decision to deport Colombians Caracas accuses of being paramilitaries and smugglers comes amid a major economic crisis in the socialist-led country and months before the Venezuelan people take to the polls to elect a new National Assembly.